Some of the stamps featured in the U.S. Postal Service's Disney villain stamps. Your local post office is about to get a little bit more wicked. The U.S. 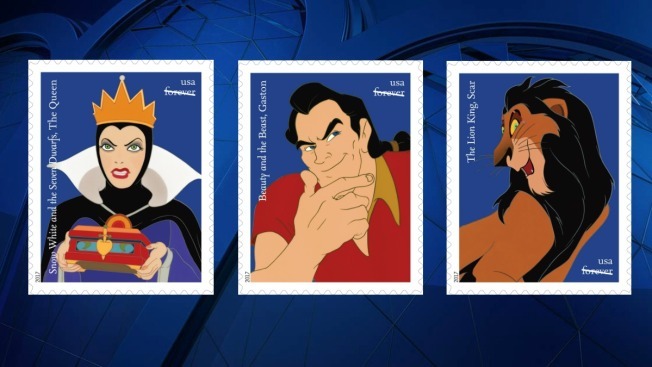 Postal Service will release a new round of Forever stamps Saturday, featuring 10 classic Disney villains. Send a letter to the Disney fan in your life with a stamp featuring Maleficent, Cruella de Vil, Scar and more. This isn’t the first time that Disney has joined forces with the U.S. Postal Service. Stamps released in 2012 depict characters from “Finding Nemo,” “Toy Story” and “Monsters, Inc.” Walt Disney himself appeared alongside cartoon children on a stamp issued in 1968, according to an article written by Ed Bergen, a stamp collector with a passion for Disney. "It’s fairly atypical for the U.S. Postal Service to use trademarked images that aren’t their own trademarked images," English said. "I think that speaks to the power of Disney that they break with their tradition and do that with these characters." The stamp designs were created by Postal Service art director Derry Noyes in collaboration with Disney Creative Director David Pacheco and Walt Disney Studio’s Ink and Paint Department. A pane of 20 Forever stamps will be available Saturday at post offices. Pre-order now by going here.